Performance Testing Basics What is Throughput? / Performance Testing Basics What is Throughput? 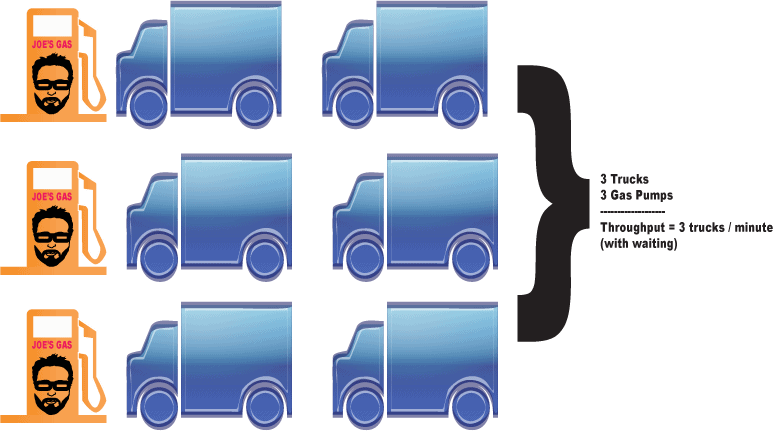 Throughput is one of the most misunderstood performance testing concepts new testers sometimes struggle with. So what is throughput? Basically, “Throughput” is the amount of transactions produced over time during a test. It’s also expressed as the amount of capacity that a website or application can handle. Also before starting a performance test it is common to have a throughput goal that the application needs to be able to handle a specific number of request per hr. For example: Let’s imagine that a gas station attendant fills up a car’s gas tank using a gas pump. Let’s also say that it always takes the gas attendant just one minute to fill up any car, no matter how big it is or how low the car’s gas tank is. Let’s call this gas station “Joe’s Gas,” and envision that it only has three gas pumps. Naturally, if we have three gas pumps and three cars, it follows that Joe’s attendants can only fill up three cars per minute. So, if we were to fill out a performance report for Joe’s gas station, it would show that Joe’s throughput is three cars per minute. This is Joe’s dilemma: no matter how many cars need gas, the maximum number that can be handled during a specific time frame will always be the same –three. This is our maximum throughput; it is a fixed upper bound constraint. 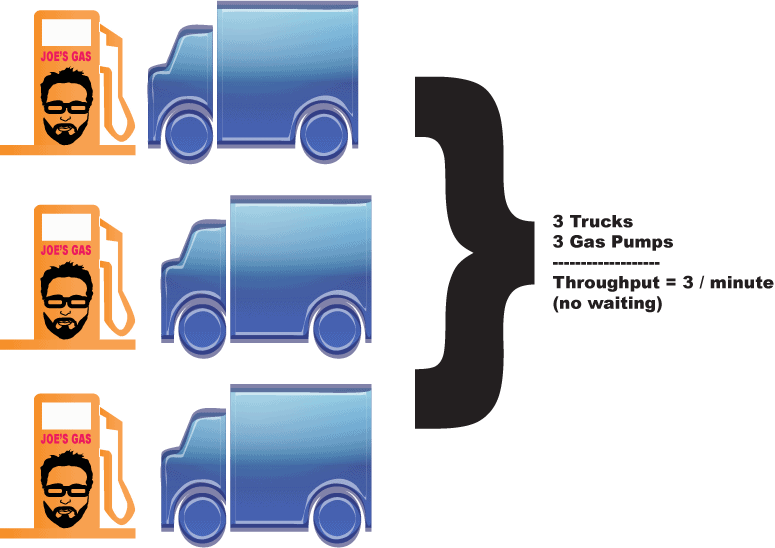 As more vehicles enter the gas pump line they are required to wait, thus creating a queue. It is the same concept that applies if we are testing a web application. If a web app receives 50 requests per second, but can only handle 30 transactions per second, the other 20 requests end up waiting in a queue. 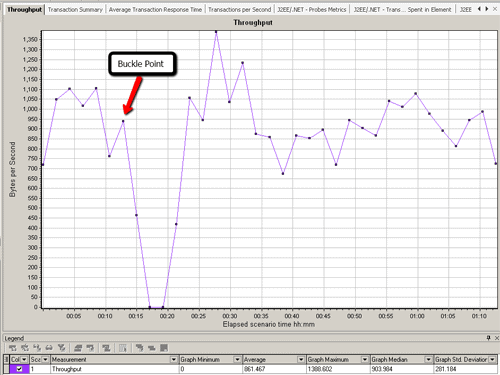 When presenting performance test results, throughput performance is often expressed as transactions per second, or TPS. I use HP’s LoadRunner (which comes with a throughput monitor) for performance testing. But other tools like jMeter have similar meters. In a typical test scenario, as users begin ramping up and making requests, the throughput created will increase as well. Once all users are logged in and processing in a steady state, the throughput will even out since the load each user makes stays relatively constant. If we wanted to find an environment’s throughput upper bound we would continue increasing the number of users. Eventually, after a certain amount of users are added, the throughput will start to even out, and may even drop. 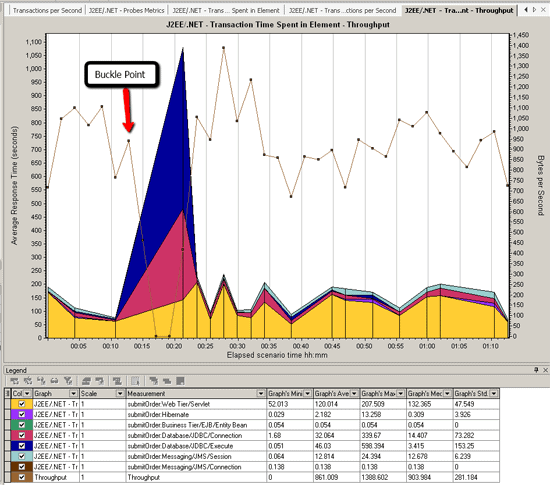 If the throughput enters this state, however, it is usually due to some kind of bottleneck in the application. 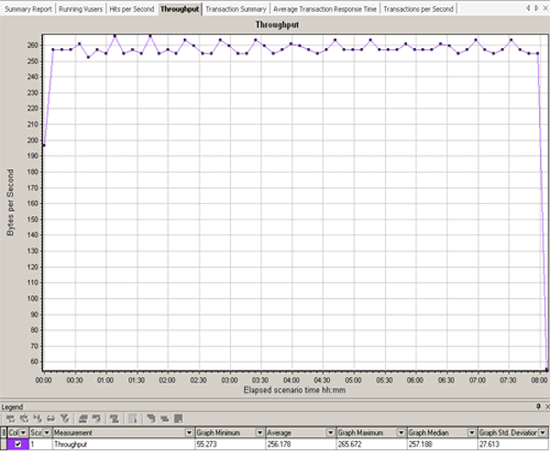 Below are the LoadRunner throughput chart results for a 25-user test that I recently ran. Notice that once all 25 concurrent users are logged in and doing work, the throughput stays fairly consistent. This is expected. Now notice what throughput looks like on a test that did not perform as well as the last example. All of the users log in and start working; once all users are logged in making request you would expect the throughput to flatline. But in fact, we see it plummet. This is not good. For more detail info on performance testing make sure to grab a copy of Performance Analysis for Java(TM) Websites. Also make sure to check out some interviews with some of the biggest names in performance testing to discover even more performance testing awesomeness. Excellent. It helped me to understand with the simple examples and the visual graphs. Hi Joe, thank you for the explanation on throughput. I really like the gas station analogy. I have another basics question though. How would you define SLAs when developing a performance test plan? How much throughput is good, what is acceptable CPU on servers etc. I know there is no one size fits all, but if you can give some examples similar to the gas station analogy, would appreciate it. Thanks. Pacing is the time you wait between iterations. BTW this is a great article JOE. Thanks for the article. It’s really helpful !! Nice article. I do have one question.i was going through the Loadrunner training manual and in that it mentions “If throughput has flattened out while the number of Vusers increase, there is a likely a bandwidth issue.” But i feel your explanation is more correct. can you please shed some views on this? Mathews » Hi – First I would use a performance test tool like LoadRunner,SoaSta, Grinder or JMeter to place a load against the test system. I would start with one user and increase the user load by small increments until I found the throughput plateau. I consider a plateau to be the point where either the throughput really falls off or the response time is well over what is acceptable for my requirements.That’s it in a nutshell – this may be to basic for your needs. i want to know that what is throughput out and throughput in. one think i must tell you, your way of explaining is toooooo good. Thanks Joe for this wonderful post, it helped me a lot. However it is clear to me but I just wanted to confirm that throughput(It is also a term in Argeegate Report(Listener) of Apache Jmeter) is same as processing rate of requests, a high throughput means high performance, Right? What is ADHOC testing and when & why this testing is done? Excellent Stuff. Finally I am able to understand throughput now. Thank you, Joe! I like comparison with gas station)))). BTW, what do you advise to start from when analyzing results? Do you use the same approach as in the article from below? Thanks a lot for providing this nice information. Its the best article I have ever went through with very simple and elaborative examples. Its really helpful. Can you please publish few more similar articles on most important LoadRunner monitors like Hits per Seconds, Average Transaction Response Time etc.? Very Nice article with lot of information. Please Provide more information on performance testing with LR. JOE>> This is a very good portal for performance testing. Well Done!!!!!!!! I am using 9.1 loadrunner, how do we get – HP Diagnostics ‘J2EE – Transaction Time Spent in Element’ graph which show database/appserver in our case. Vinod » Thanks! Do you have a license for HP Diagnostics? Thanks a lot ….Joe’s gas gave a good understanding of throughput. Shinto Abraham M.A » Great! Thanks joe for the information pertaining to Throughput. Appreciate the way you explained Throughput. What is the difference between Think Time and Pacing, if we give think time before “return 0” in script then it will also work like pacing, then wats the difference? thanks joe, it is reallu useful for understanding what throughput is. the throughput and bandwidth will also increase? Very Informative article!!! Thanks Joe! I have a query,we are using LR11. Could u please tell me how to calculate pacing time and what is its significance? should we include Think time as well in pacing time or not? Its a excellent post, and helped me a lot .. could you please explain the relation between hits/sec, response time and throughput……as I am seeing a lot of people saying different views about this .. Very nice example…..good way to present the basic concepts…. I read the article, you explained very well about throughput. Than you so much. But i did not understand what is the database issue. which database counter you measured for throughput. If you don’t mind can you elaborate in detail the ” back end work was being queued up due to a database issue”. Hi Ramamurthy – if I remember correctly this issue was that the web server was sending request to the DB but the DB was too busy trying to fulfill previous request. Because of this all the request where building up in a queue. The web servers Processor Queue Length kept increasing which was a clue to me that something was happening on the DB side. I had a db administrator monitor the DB as the test ran to pinpoint what was happening. I have a question… If the hits per sec is high and the throughput is low,what does it mean? Joe-Thank you so much for reply. 1. Network bandwidth- constraint. beacuse htis/sec increases as vusers increase also throughtput also increase. but throughput decreases means shortage in the network bandwith or more utilization or crossing the limit of bandwidth. 2. Less number configeration of thread pools. 3. CPU utlization reached more than 90%. Please correct if i am worng for above points regarding the throughtput decrease eventhough Hits/sec increases. i have one doubt in load runner? if we increase the through put, should the response time take more time? Depends – in general I would say eventually yes as your throughput goes up response time usually goes up as well once the server’s resources start to get heavily utilized. Hi Gaurav – great question but its hard to answer other then it depends. I think at a minimum you want to do some kind of Load test to make sure that performance has not changed from the previous release. Also you want to do performance testing as early as possible. Joe …Thankyou verymuch for this excellent article. That was a nice post on throughput, but one thing i am not clear about is the difference between throughput and hits/sec. Are these same? If not, what is the difference? I am new to performance testing. I want to learn scripting in Load runner. I have intermediate knowledge of c language. Could you please let me know what should be my next step (resources or websites i should refer to, any dumps or examples which i can refer to)? Also, what should i refer to be able to learn performance tuning? Hi Rahul I would first check out the podcast PerfBytes which is hosted by Mark Tomlinson and James Pulley. Between the two of them they have more then 40 years or performance testing experience. I want to know if thoughput in JMeter consist of network latency or just pure server throughput? I know ideally we should run perf test from LAN to avoid network latency. But I am testing web app which is hosted on cloud. Cant skip network latency. 2. Am facing performance issue while I run a load test for the target tps 25, am not able to reach more than 11 tps and my response time is also keep increasing where it should b 0.5 sec on average as per business requirement..I doubt it could b due to threads but not sure of exactly. I have been reading through the QAs and finding it very helpful. I just started to learn about performance testing. I am looking for a good blog/video on correlation and parametization. Can you suggest some? Thannks! Does this help: https://www.youtube.com/watch?v=xQXfNBaHclQ ? Very specific and easy to understand.helped me a lot. Thanks and keep it going!! Very Nice Post. Thank you for posting this with simple example. Could you please post “Performance testing stages using Jmeter”. I really want to know the exact process of performance testing using Jmeter. Hi Joe, This article has a conceptual error. Throughput in any other form of testing may be defined as number of transactions executed per second, but when it comes to Performance testing, Throughput is defined as Bytes transferred per second. LoadRunner defines it as Bytes Received per second. But since the number of transactions per second is most probably directly proportional to Bytes Received per second (Not always), your analysis to the said still holds good in that direction. But I wanted to point that the Throughput definition you have mentioned has been misleading and other viewers of this blog seem to buy this. May be a honest overlook from your side. Hope you will correct it. Excellent article I’ve ever read to understand throughput. Nice post..however I have a question related to my application. In my application there are 4 different scenarios which we have covered, for one of the particular scenario (GUI ) the hits per second and throughput are coming zero. Similarly in my second project also which is a desktop based application the hits per second and throughput is coming zero as well. Is there any concept that for any desktop based or GUI application these parameters will remain zero? 15+ Experts Reveal Their Top Security Testing Secrets. Join SecureGuild an online conference dedicated 100% to Security Testing!